The World Service’s programme In The Studio takes us into the minds and processes of leading and emerging figures from across the creative world. The programme on 2 May followed Imtiaz Dharker through her working day and night. Imtiaz Dharker was awarded the Queen's Gold Medal for Poetry for her fifth collection Over the Moon and for her services to poetry. Imtiaz’s Poetry Live! performance included an extract from her reading her poem ‘Dabba’s Dialogue or Tiffin-box talks’ from Leaving Fingerprints and the whole of ‘The Trick’. Imtiaz also mentioned that she likes to read her poem ‘Over the Moon’ at those readings. An extract from this interview featured on Radio 4's Pick of the Week on 7 May 2017. Hardeep Singh Kohli chose a clip from the World Service’s programme In The Studio: Imtiaz Dharker for Radio 4’s Pick of the Week on 7 May. 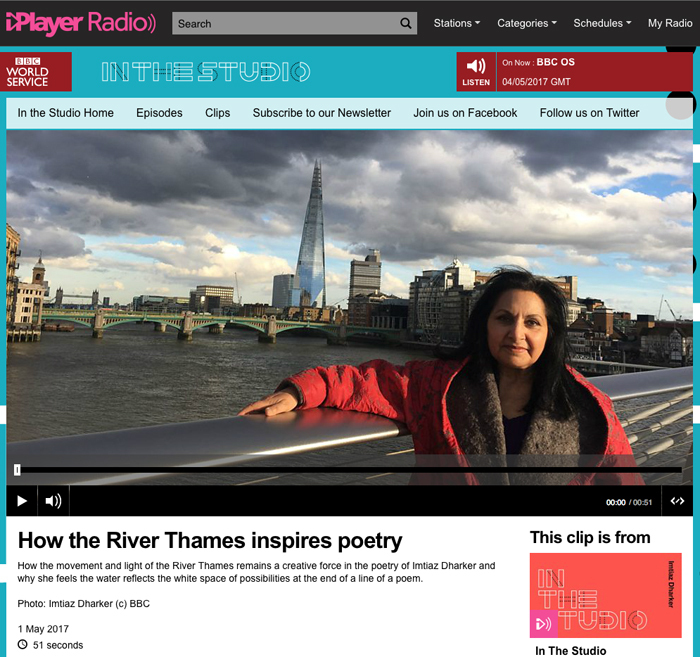 The clip featured Imtiaz Dharker talking about the River Thames and relating it to writing poetry. At the end, Hardeep said ‘Simply sumptuous!’. The original programme aired on 2 May and followed Imtiaz Dharker through her working day (and night).